The consistent successful deliveries of our projects don’t come via chance, hope or luck. We’d like to say that we are just naturally gifted developers, designers, strategists with the midas touch but that too would be taking away from something more meaningful. Because it is through an understanding of what makes a delivery successful - not just in the product itself but in the real world the use of it, that we have been able to lay the groundwork for the success in all our future projects. Our deliveries for Link Market Services, HirePlants and AssetOne, have not just being successful in achieving the initial goals set by the client, but they have also gone on to create new and untapped areas of success and revenue for those vendors. And it is not a regimented process we have implemented, it is not restrictive or overbearing but more like a set of guidelines, a digital northern star that we look too when we have any doubts, troubles or ideas. Human-centred design applies to all digital products used by people, whether it is a business developing an internal product for its employees or a startup looking to create a new app. It is not a hard process to follow, but one that can easily be ignored when concentrating too much on aesthetics or competitors’ products. It is about creating a product that solves an immediate need for the user while also creating a positive experience that feels custom made for them. We achieve this at Webscope by testing what we are delivering with real people and data throughout the build. 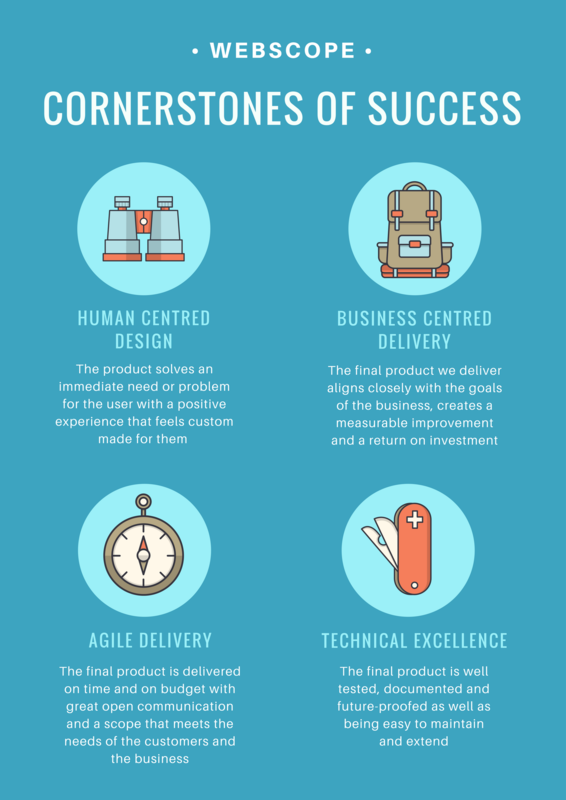 Business-Centred Delivery ensures that when you approach a development company for digital work, the final digital product delivered aligns closely with the goals of the business, creates a measurable improvement, and provides a genuine return on investment. This is done by gaining a deep understanding of our client through workshopping. It is amazing what you can find out about a business with a whiteboard, a lot of post-it notes as well as some cake and coffee! When a development company follows the process of Agile Delivery, the final digital product is delivered on time, on budget and with a scope that meets the needs of the business. We ensure this by delivering production ready code in 2 week bursts of work, what we call Sprints. And by doing work in small blocks and demoing what we have built to our clients at the end of each block, we are not only guaranteeing a product aligned to the clients vision, but we are also creating a flexible environment for the client where the scope can be adjusted at any stage. Technical excellence is the foundation of all the digital products we build for our clients. It keeps costs and delays down as well as providing a solid digital platform that successfully drives a company upwards while outpacing their competition. This is done by ensuring that the final product is well tested, documented and future-proofed while also being easy to maintain and extend. We also employ best in-class development methodologies and tools that guarantees this. It is by having these four cornerstones that we have enabled us to be the development company we are today, creating world first software in Bitcoin, financial and service-based industries. And although these cornerstones may not all be unique individually, it is the consistent implementation of all four that makes us unique, successful and innovative.